Chain maintenance and user tips. The transmission is an essential technical component of your motorcycle. Faulty assembly or wrong choice of chain can result in damage or injury. Rely on the expertise of DC AFAM and use the recommended chain of his chain kits. Our chains are supplied with a suitable connecting link adapted to the application and power of your motorcycle. Clip type connecting links semi-press fit are used for high quality Motocross chains. Because of its precision, the connecting link does not differ from the other links in the chain. The closed part of the clip always points in the direction of travel. Before you replace the old chain, check and replace if necessary chain guides, bearings and the silent blocks. There should be no contact between the chain and metal parts of your motorcycle except the sprockets. Such contact can result in chain breakage. To extend the life of your chain you have to lubricate your chain regularly. This depends on the driving conditions, your chain should never run dry. In dry driving conditions lubricate after 500 to 600 km. Do not use too sticky grease but a good fluid and penetrating lubricant. Lubricate all moving parts and do not forget to lubricate along the X-rings. 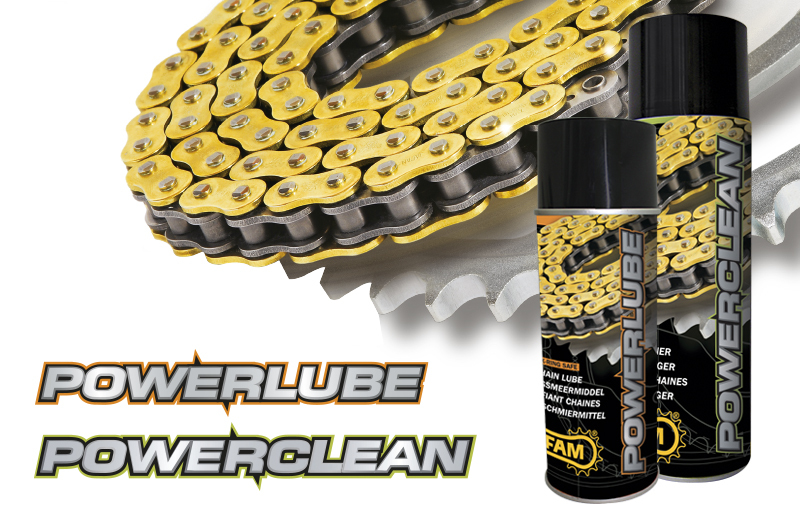 We recommend the use of AFAM Powerlube chain spray. Lubricate after cleaning and after riding in the rain. Avoid any contact with battery acid. Acid changed the characteristics of the metal and leads to a chemical crack. If the chain came in contact with acid always replace the chain. Rinse your chain with water after contact with road salt in winter in order to prevent corrosion. DC AFAM chains are manufactured to the highest Japanese standards and guaranteed against manufacturing defects. However, any warranty claim will be rejected if the above rules are not followed or incorrect assembly. Open chains need special attention and should be connected the right way. The riveting of the connecting link is the responsibility of the mechanic. To mount the connecting link, we recommend using the AFAM tool DRCP2, DRCP3 or EASY RIV5. DC AFAM can only provide a guarantee after the failed chain has been examined by our technical department and being approved for guarantee.